You may also be thinking about a third question: What bird books should I give myself for the holidays? The answer takes one click (after you read this review). Take a look and listen to the ABA podcast and blog, where Nate Swick and I discuss Best Bird Books of 2017 and list our Top Five. Introduction: The 8-page Introduction, down from fourteen pages in the 4th edition, succinctly and intelligently describes the contents of the field guide and the concepts and vocabulary behind it–AOU taxonomy, scientific names, subspecies, molt and plumage sequence, range and distribution maps. 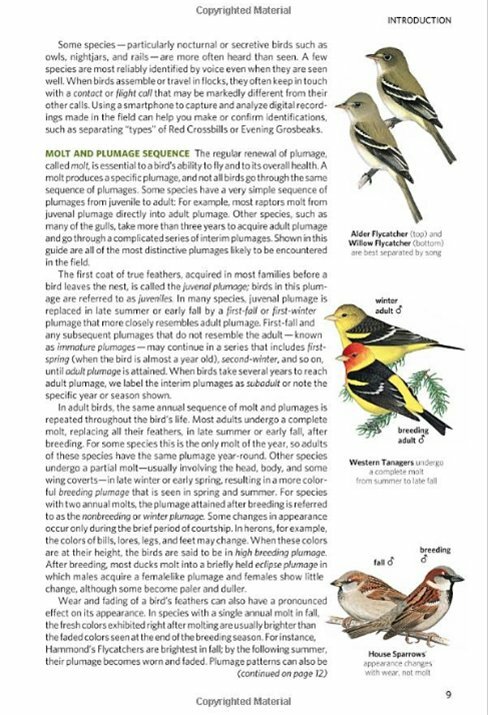 Like all field guide introductions, this is must reading, especially since co-author Jon Dunn does a magnificent job of compressing the varied and complex process of molt into a little over a page. 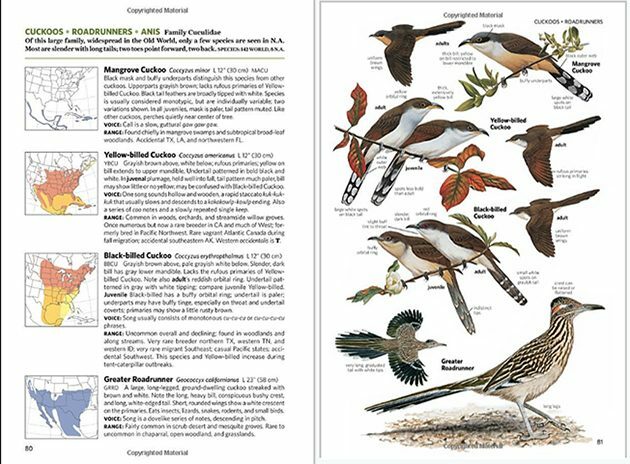 The two-page spread on Parts of a Bird provides diagrams for the topographical terms used in the Species Accounts, including hummingbird, shorebird, gull, passerine, and every feather on the upper wing of an adult Lark Sparrow. Illustrations from the Species Accounts nicely illustrate points, such as the use of song to identify similar birds and the process of a complete molt. Species Accounts: With 1,023 species, National Geographic 7 continues to cover the most species of any North American field guide. 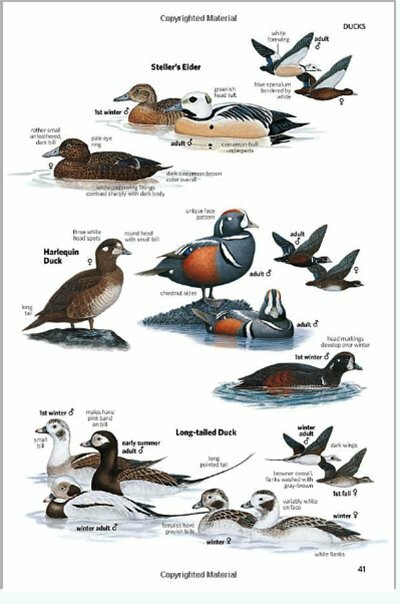 The Sibley Guide to Birds, 2nd edition (2014) covers 923 species; The Stokes Field Guide to the Birds of North America (2010) 816; Peterson Field Guide to Birds of North America (2008) 544; Smithsonian Field Guide to the Birds of North America (2008) 528; and the Kaufman Field Guide to Birds of North America (2005) covers 392 species. Most of the species are described in the Species Accounts, arranged taxonomically into 86 family chapters. “Ducks, Geese, and Swans” in the front, “Blackbirds” in the back; “Caracaras and Falcons” next to “Old World Parrots,” “Loons” about one-third of the way down the list, after “Tropicbirds” and before “Albatrosses.” It’s a tough, fast-changing taxonomic world out there! Each family chapter begins with a brief, bold-printed description of the common traits of the species in the family and an enumeration of the number of species worldwide and the number of species in North America. Following the traditional design of this field guide series, text and range maps are on the left and images are on the right. Each text account consists of the following: Common name; scientific name; size (inches and centimeters, length is given for all species, wingspan for selected species); 4-letter banding code; physical description generally; distinguishing field marks of male, female and immature as needed; voice; and range (which includes information on habitat, abundance, and seasonal status that cannot be shown on the map). Range maps are given for all species except accidental, non-established exotic, extirpated, limited-range introduced, and probably extinct species. The text is highly detailed, with an emphasis on identification in the field using plumage details and sorting out differences from similar species. 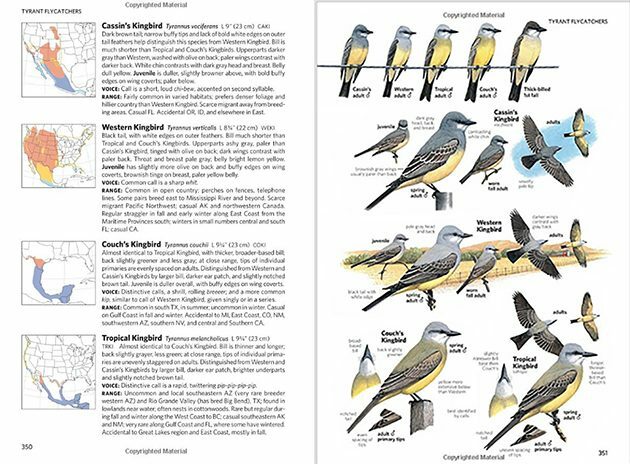 Cassin’s Kingbird’s bill is shorter than Tropical and Couch’s Kingbirds; Tropical Kingbirds have a darker ear patch from Western and Cassin’s; a juvenile Couch’s Kingbird has buffy edges on its wing coverts. Gull accounts are particularly long, detailing the birds’ diverse age plumages. Behavior is sometimes touched on (American Kestrel “feeds on insects, reptiles, and small mammals, hovering over prey before plunging,” territorial adult male Lucifer Hummingbird “perches on bare branch,” plovers “run and stop abruptly when foraging”), but the clear emphasis is on plumage with occasional taxonomic notes. Illustrations on the right-hand page show each species standing or perched, often in a bit of its most typical habit (a sandy beach, by a shoreline, perched on a conifer or cactus). Male and female, adult and juvenile plumages are depicted when there are significant differences. Flight images are included for many species, but not all, and many of the new illustrations for this volume are additional flight drawings. 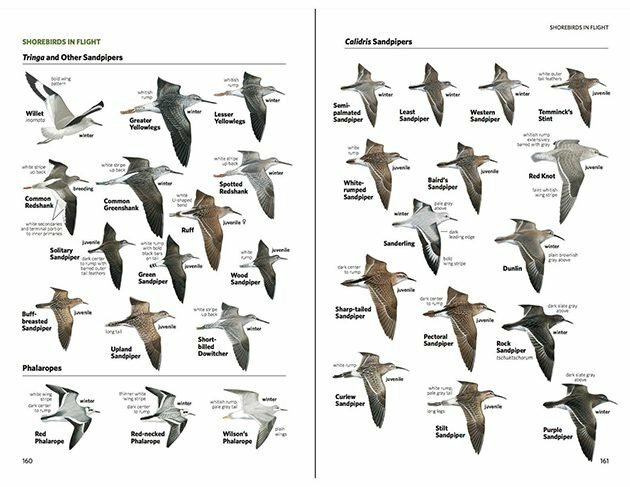 There are also two-page comparative spreads of ducks, shorebirds, gulls, and hawks in flight. Extensive notes accompany the images, reinforcing the text and adding new details. Range Maps: The range maps, edited by Paul Lehman, are one of the best features of National Geographic field guides. I’m glad that they have been enlarged since the 4th edition (the first one I owned). Seasonal migration routes were added in the 6th edition, an excellent feature, especially for shorebird and seabird fans. 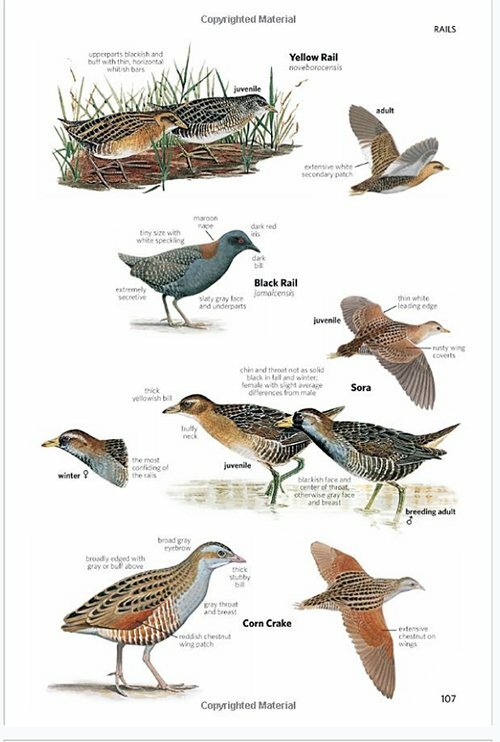 Compare the Baird’s Sandpiper maps in NatGeo and Sibley. Sibley shows the migration route through the non-coastal state and provinces in yellow; NatGeo shows spring and autumn migration through the central states and provinces in light-orange and autumn migration through the east and west in yellow. I also like the positioning of the Range Map Symbols on the inside back cover flap, it makes it so easy to figure these things out! 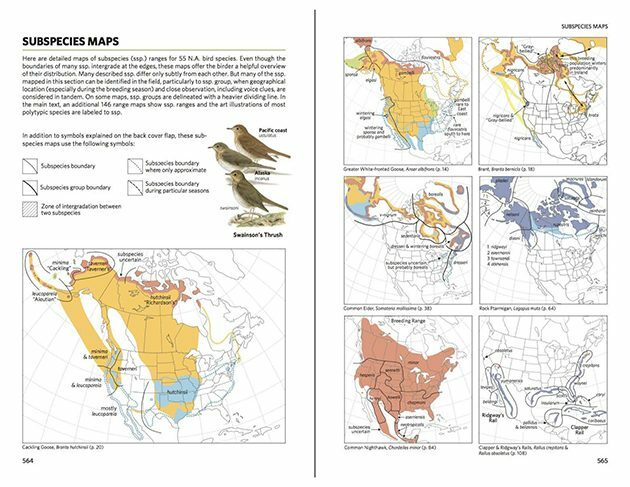 Subspecies maps were also added in the 6th edition, and 16 were added in this edition, including maps for Song Sparrow (a big one! ), Black-capped Chickadee, and Rock Ptarmigan. Interestingly, the subspecies map for Western Scrub-Jay that appeared in the 6th edition now appears as the subspecies map for California and Woodhouse’s Scrub-Jays (Western was split). It is almost the same map, a bit smaller, but with a double line separating California and Woodhouse’s and the substitution of species names for two of the three group names (Sumichrast’s Group is still a group, now part of Woodhouse’s Scrub-Jay). An efficient solution to what I imagine was a space problem, but one that could have used a sentence or two of explanation. There are page references to and from the Species Accounts maps, which makes research transparently easy. And, subspecies are also treated visually and often in the text of the Main Species accounts. More on Illustrations: The National Geographic field guide series has been illustrated by a succession of artists over the years. Four artists worked on this edition–co-author Jonathan Alderfer, David Quinn, John Schmitt, and Thomas Schultz. They were building on a volume of work created by a total of 20 artists working on six previous editions, each of whom is credited in the tiny print of the Art Credits section in the back. This multiplicity is arguably the weakest point of the field guide; there is variability in the style of artwork throughout the book and within the page. In the Shorebirds in Flight pages, above, five artists’ work is represented. Here it works, even with the wing lift of Michael O’Brien’s Willet. There are more subtle differences in the Rail plate at the beginning of this review, where two artists’ work is represented, and major differences in the Embeizids (Sparrows) section, especially amongst the Ammodramus species. On the very positive side, a lot of work has been done in each of the recent editions on the illustrations, and the Introduction recounts the research that went on behind the artwork–use of photographs, museum specimens, and the most recent bird-identification literature. The new Hummingbirds are simply beautiful, and, more importantly, drawn and arranged so we can easily see distinguishing features such as bills, underparts, and tail feathers (which, don’t forget, are tiny and hard to see in the field). 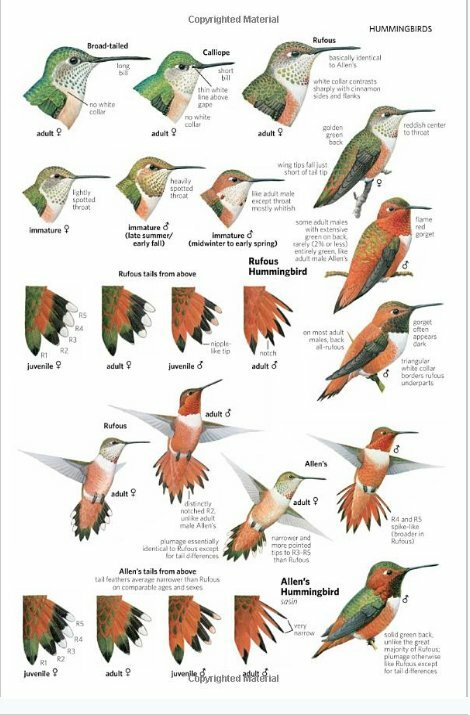 Rufous and Allen’s Hummingbirds, for example: The 6th edition contained five images of the birds perched and in flight and four close-ups of the tails (for both birds). The 7th edition offers four images of the hummingbirds perched, four in flight, eight close-ups of tail feathers (four images for each bird showing juvenile and adult male and female), plus comparative close-ups of Broad-tailed, Calliope and Rufous bills. The arrangement of the images have all the birds facing right, a huge improvement on the edition 6 plate, which was pretty but confusing, with the birds facing every which way. Even pages that have not gotten a total redo have been tweaked. The Cuckoo page above, for example, includes a new illustration of Greater Roadrunner in flight. Bonaparte’s Gull now has a standing juvenile. The images of light- and dark-morph Rough-legged Hawks in flight have been enlarged and re-arranged so we can compare them side-by-side. Accidental & Exotic Species: National Geographic 7 describes almost all of the accidental and exotic species that have been documented in North America, plus 4 extinct species, 2 that are probably extinct, and 2 that are extirpated. Ninety-four accidental and extinct species are covered in the back-of-the-book section “Accidentals and Extinct Species,” where the birds are pictured and described in one paragraph. The description includes distinguishing features and documentation dates or specimen records. The dividing line of which accidental species appear in the back and which are covered in the main Species Accounts section can be a bit tricky. The authors tell us that the back of the book section consists of “fewer than three records in the past two decades or five records in the last hundred years,” cautioning that this applies “for most.” An informative interview with the authors in Birdwatching Magazine expands on this with the explanation that some rarities are included in the main Species Accounts for comparison purposes or because they ran out of space in the back section. Also, a search for one of the suspected extinct species, Ivory-billed Woodpecker, finds it in the main section. All of which is to say, if in doubt, use the index! The bird you are looking for is most likely there. Many exotic species are covered, far beyond those accepted by the ABA Checklist Committee. For example, 16 species are described in the Psittacidae family section (African and New World Parrots), of which five are accepted by the ABA (which the family description nicely tells us). Accessibility, or How Do I Find the Birds in the Book? My first NatGeo guide was the 4th edition, but I totally fell in love with it when I saw the 5th edition, the first one with the thumb tabs. In the 7th edition, these seven tabs allow you to instantly go to chapters on Sandpipers, Gulls, Hawks, Flycatchers, Thrushes, Warblers, and Sparrows (a slight change from the 6th edition, which had a Finches tab but not a Thrushes tab). 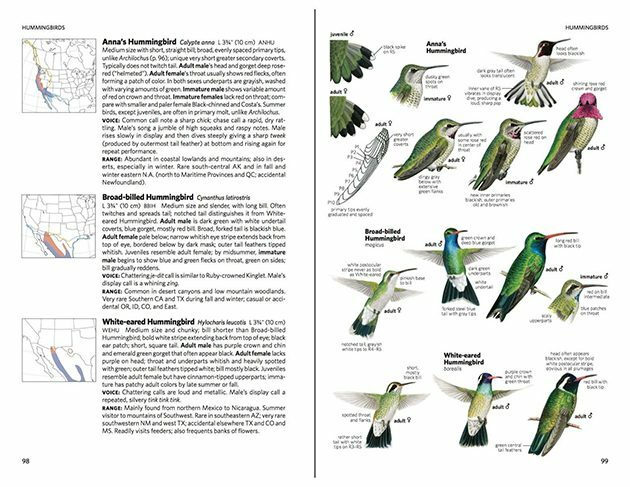 A second quick finding tool is the Visual Index of Bird Families on the inside front and back covers, presenting the 86 chapters in order with bird images, text, and page numbers. The VIBF is a lot friendlier than the Table of Contents, expanding and translating the list’s brief and sometimes scientific terms. Emberizids, for example, becomes “Towhees, Sparrows” in the VIBF, illustrated with small images of Dark-eyed Junco, Eastern Towhee, Lark Bunting, Savannah and Grasshopper Sparrows (most of the chapters have fewer examples). The back of the book Index is good, listing common and scientific names in alphabetical order, utilizing the main term, and boldfacing the page numbers of the main species accounts. (Additional page numbers refer to the species in flight spreads or the subspecies maps.) My main quibble is that hyphenated bird names like Wood-Pewee and Scrub-Jay are listed by the second part of the name–under Pewee and Jay. I am guessing that this system (which is also used in Sibley) is based on the National Information Standards Organization (NISO) Guidelines for Alphabetical Arrangement of Letters and Sorting of Numerals and Other Symbols (1999), but it seems counter-intuitive to me. Authors: Jon L. Dunn is an expert in bird taxonomy (member of the Committee on Classification and Nomenclature of North and Middle American Birds (NACC) of the American Ornithologists’ Society, long-time member of the California Birds Records Committee, past service on the ABA Checklist Committee including committee chair, and author of many journal articles), professional tour leader for Wings, and the co-author of A Field Guide to Warblers of North America (1997, with Kimball Garrett), National Geographic Birding Essentials: All the Tools, Techniques, and Tips You Need to Begin and Become a Better Birder (2007, with Jonathan Alderfer), and co-author (billed as co-chief and chief consultant in the early years) of all editions of the National Geographic Field Guide to the Birds of North America series, from the first edition in 1983. In the interests of disclosure, I had the pleasure of being part of a Wings tour to Cuba led by Jon Dunn earlier this year, which gave me the advantage of hearing about the work he put into this and past volumes and about how the timing of this volume was just missing final decisions on the newest AOU taxonomic supplement. I also learned a lot about Leonard Cohen. Conclusions & Recommendations: The publication of National Geographic Field Guide to the Birds of North America, 7th Edition is one of the top bird book events of 2017 (and, if you haven’t already gone to the ABA site, it is my number one of my Top Five books of 2017 and Nate Swick’s number two choice). It is comprehensive, up-to-date, chock full of clearly written identification information, authored by one North America’s top field identification experts. The editors continue to update and improve the artwork, utilizing the talents of top nature illustrators, offering multiple images of each species that show plumage variations and, often, the bird in flight. It is accessible–you can very easily find species and families using the visual and print indexes and thumb tabs. It is highly affordable. It is heavy at 591 pages using good paper, but can be carried in a backpack. Should you buy this 7th edition if you already have the 6th? Maybe. I think the 6th edition would suffice, especially if you are not the type of birder who chases rarities or cares about taxonomy. But, keep in mind that it is not just hummingbirds that have been revised. I’ve compared specific species accounts, and though many are the same, there are many more that feature updated illustrations and tweaked text. Mississippi Kite, for example. Looks exactly the same at first until you notice brand-new images of the kite in flight. That’s a new juvenile next to the male and female, larger images, and expanded notes on plumage features to look for in flying juveniles and females. (And, this has nothing to do with this comparison, but I’m hoping that the 8th edition will include a note about the breeding Mississippi Kites in Wareham, N.J., maybe not documented substantially enough for this edition.) Back to the comparison: I think purchasing the 7th edition is a relatively small investment to make to have the most up-to-date information at your fingertips. We really can have nice things for a reasonable price. 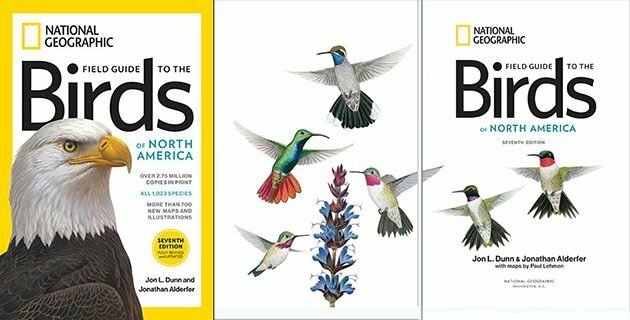 How does National Geographic Field Guide to the Birds of North America, 7th Edition compare to The Sibley Guide to Birds, 2nd edition and other field guides? I know, I promised an answer to this question. I love all my field guides, but I think it is fair to say that at this point in time, NatGeo and Sibley are at the top of the stack, both in comprehensiveness and currency. Both are written and illustrated by experts in avian field identification. NatGeo’s features on subspecies and its comprehensive coverage of rarities make it a smart choice for advanced birders. It is also more affordable, with a list price of $27.95. Some birders might prefer Sibley because it is written and illustrated by one person, giving it a uniformity of vision and artistic presentation. Comparing individual species accounts, Sibley is often easier to read, with one or two species to a page. This is, of course, partly a function of its much larger size and coverage of fewer species. And, this is a key point–if you want a book you can actually carry in the field, which covers all of North America, NatGeo is the number one choice. However, the question of which field guide to buy becomes even more complicated when regional guides are brought into the mix. For many birders, especially those who do not travel, it is a choice between the regional editions of Sibley, published in 2016, and NatGeo. Both are portable, both are affordable; both have “flexible” covers that withstand wear (to a certain extent). It is a conundrum, and this is where I think individual learning preferences come into play. To co-opt a phrase from Marie Kondo, which field guide brings you the joy of discovery? The wonder of research? There is really no wrong answer to this question, no wrong choice. We are living in a wonderfully rich world of birding resources. Great Review! Did you notice that Alaska and Arkansas have the same two-letter abbreviation (AK)? I think that the Sibley has this also. My bad! The Nat Geo 7 does not have a North America map annotated with states and territories and abbreviations, It is the new Crossley Waterfowl guide, and, yes, the Sibley 2nd edition, that have Alaska and Arkansas both designated with the abbreviation AK. Hi Alan–Oops. I did not notice that when I reviewed those other two guides, though I have been noticing many typos and similar map and pagination errors in many books. I only cite them in a review if I think it affects using the book. I don’t know why this is happening so much. Maybe cutbacks in the publishing industry? Not enough proofreaders? So I’d like to know, does the Seventh Edition have updated range maps? Examples of species which I remember noting: Redhead and Turkey Vulture. Good question, Paul. The Introduction says, as I mention in the review, that there are 50 new range maps and 16 new subspecies range maps. Interestingly, the Birdwatching Magazine interview says that 80 new maps (maybe more were done after the Introduction was written?) and 350 map revisions. The revisions involved map editor Paul Lehman consulting regional experts. Lehman also edited the text range descriptions. I’ll look up the two species you ask about later in the week when I have both the 6th and 7th editions in front of me again. Ah, right, you did mention new range maps. For some reason I didn’t interpret that as meaning updated range maps but I expect that’s what you meant. Where Are You Birding This First Weekend of February 2012?